This late 19th century Louis XV style French side table features an intricate parquetry design in a diamond-shape pattern. The top and skirting of the table both feature this design and are bordered with scrolling acanthus leaf gilt bronze mounts along their curved edges. To the front there is a drawer, and the table sits on four cabriole legs set on gilt bronze claw feet. 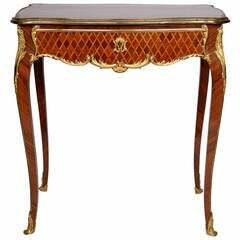 This elegant Rococo table would make a fine addition to any luxury interior. A mid-18th century French Louis XV period Provincial cherry one drawer writing table, circa 1760.